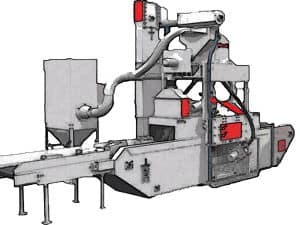 In this section you can find a list of used shot blasting machines for marble, granite, natural stone and cement working. Shot blasting machines are used to execute the shot blasting procedure, a procedure by which the surface of a product is eroded with abrasive material blasts for the purpose of removing crusts, rust, paint and bringing the material back to its original state. They perform a powerful high-speed blast that allows working on bigger sized, more resistant materials. 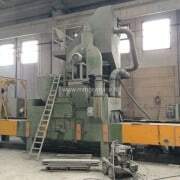 These used and second hand shot blasting machines come from bankruptcies or companies who update their production line. We can also handle the dismantling and loading on trucks or containers . Used shot blasting machines for stone, concrete and aggregate products Tosca TS-R 1200 TLF; Turbines: 3 (2 above and 1 at the side) Available widths: 1200 mm; Pass-through height: 400 mm.